Everyday now we see headlines with percentages and numbers of jobs threatened by machines. As technology gets smarter by the day, public anxiety regarding job losses keeps mounting. The terms artificial intelligence (AI), automation, robots invoke a scary world for many, a world where they have been rendered redundant. That fear seems to be on the minds of many in Singapore too. 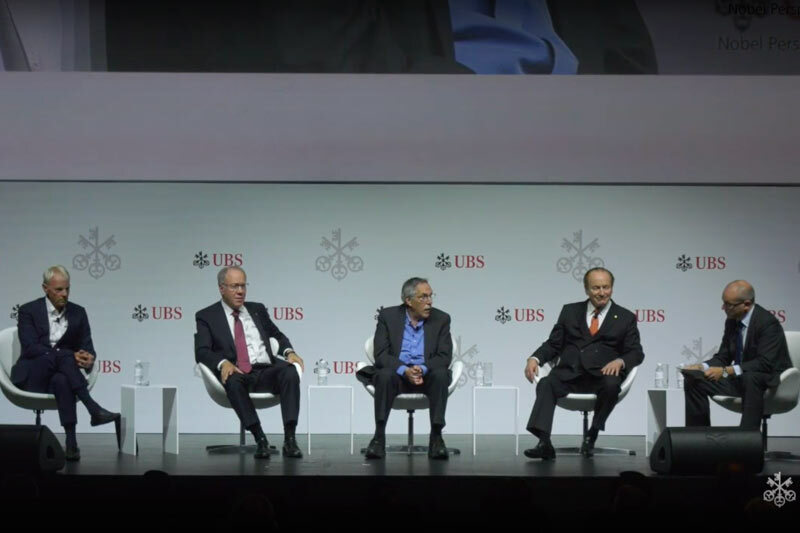 UBS brought four Nobel Laureates in the Economic Sciences to Singapore in the first leg of its global Nobel Perspectives Live! Event on August 30 to share their thoughts on how the economy of the future is being shaped by technology. Prior to the main event which was attended by over 1000 students eager to listen to the Nobel laureates on global trends, a media briefing was held. Michael Spence from NYU Stern, Robert Merton from Massachusetts Institute of Technology (MIT) and Harvard University, Roger B. Myerson of the University of Chicago and Peter A. Diamond from MIT got together in a panel discussion and spent some time in answering questions, most of which circled back to the issue of technology driven unemployment. The general consensus appeared to be that technology is not headed towards replacing people. Instead it will act as an enabler. Alternative hypothetical scenarios were brought up and deemed highly unlikely to happen. Mr. Myerson called upon history to demonstrate that the destruction of old jobs and the creation of new has been a constant since the beginning of the industrial revolution and the birth of the modern economy. Mr. Diamond agreed that it would be historically unprecedented if we hit a brick wall in the current technological revolution and there is no role left for humans. Mr. Myserson conceded that theoretically it is possible that a machine could be invented that would make all human input obsolete, except for the people who make the machines. The ownership of those machines could be concentrated in a small subset of humanity. Maybe the machines could be producing luxury goods for the owners. In that situation, income transfers might be necessary. But this is not imminent at the moment. The technological advances we are seeing today are complementary to humans. He added that humans will adapt to the machines and the machines will be designed to work with us. Human-machine systems becoming much more capable is more likely than machines totally displacing people. Mr. Merton pointed out that there continue to be huge swathes of important activities, where it is difficult to obtain useful feedback within a reasonable period of time on whether a process or technology is doing what is supposed to do. For instance, in wealth management it might take years or even decades to judge if a manager is doing a good job. Technology alone cannot solve things in areas which are opaque, where immediate feedback is limited. Most of these early-stage economies are in Africa, some in Latin America and maybe two or three in Asia. Most countries in Asia are now middle income and above, and they are in a natural position to make the transition to the digital economy. Mr. Spence said there have been periodic waves of handoffs of these early stage development activities in the past, for instance, from Japan to Korea and Taiwan, then to China and Vietnam. Now China is handing it off. It is stripping millions of jobs from the earlier stage export sectors and redeploying those in startups and service industries and so on. Mr. Spence said that the economies that would fail in the transition are the ones that have built in rigidities, either because of policies or culture. Expanding on the theme of flexibility, Mr. Merton said flexibility is essential because of the impossibility of predicting with any degree of accuracy what the future would look like. He used the analogy of preparing for a trip where the destination is unknown. You have to pack your bags in such a way that you can survive whether you end up in the Arctic or in Singapore. The impact of technology on employment is also dependent upon timeframes. When asked if driverless vehicles put all drivers out of jobs in next five years, would the global economic and political systems be able to cope with it, Mr. Spence replied, “The bad news is the answer is probably no, if it happens that fast. The good news is the chances of it happening that fast are very remote. It’s only in the last 5 years, that the image recognition capabilities of these things are good enough.” If the same thing, happens within 10 years, the absorptive capacity might have developed to an adequate level. But what might be required to develop that capacity? According to Mr. Myerson, there would be a need for social safety nets and public education programmes to make sure that even as people do suffer losses, that they are not faced with starvation, and that they get the opportunity to acquire the skills to take up the new jobs. For a high income, advanced country like Singapore the challenge is to figure out what jobs and employment is going to look like and then experimenting and figuring out ways to help young people prepare themselves in terms of creativity, flexibility and continuous learning. Addressing the students later, Mr. Diamond said that education in an open society such as Singapore "would give you the chance to prosper with all these new opportunities.” In addition to its “well-developed education system”, Singapore&apos;s governance and civil service system is also a key advantage, according to the panellists. "Singapore is a well-governed country," said Mr. Diamond. "You have an intelligent, well-educated, civil service. You have a system that takes their input seriously. That helps shape an environment where you can get a good education, good jobs." “Singapore is better positioned than any others to take advantage of a multi-polar world, where people from all over the world can come to Singapore and in some sense, feel at home,” said Mr. Myerson.